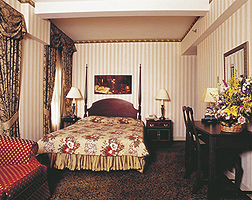 The Edison Hotel offers comfortable rooms with all the amenities a visitor to New York could need. Each room is equipped with Wi-Fi, TV with in-room movies facilities, writing desk, hairdryer and iron and ironing board. The hotel does also offer safe facilities. Rooms range from the standard double up to suites – with suites offering more room for travellers planning on a longer stay or those on business. Some rooms are adjoining – perfect for families or larger groups – and extra facilities such as small fridges may also be available.